Compact Air Horn to summon assistance in emergencies. To signal emergency assistance on land or sea, you should have the 911 Air Horn handy. 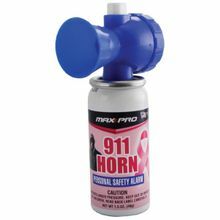 The 911 Air Horn can be used to scare away predators or signal that you need assistance with its 112 dB siren. This alarm can be heard from 1/2 mile away. Very compact in size, the sir horn is just 5 inches tall and 2.5 inches wide. Keep one handy at all time in your car, briefcase, backpack, purse, gym bag etc. Safety warning, This alarm can be damaging if used too closely to the ear. Note: The manufacturer, Max Pro supports breast cancer research. A portion of the proceeds from all purchases will be donated to help finding a cure. Shipping Restriction: Aerosols cannot be shipped by air. You must choose ground shipping or we will do it for you.